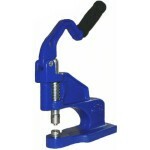 A Grommet Press sets self-piercing grommets/washers into paper, laminate, fabrics, foam core boards and many other materials. Using a 2-piece grommet/washer set, simply place your material between the 2 die pieces in your grommet press machine & push down the handle. Because our grommet presses use self-piercing grommets, you can punch the hole and set the grommets in this one simple step. The neck of the grommet punches a hole in the material and is rolled into the washer to create a firm hold in just one step. Grommet presses are simple machines to operate, so some might think that it doesn’t matter what machine they get; they’re all the same… however, this is not correct. This equipment is available for low volume (in simple desk-top hand presses), medium volume (with spring-loaded technology so minimum pressure is needed to set the grommets/washers) and high volume (pneumatic presses that get attached to an air compressor and are operated with a foot pedal). 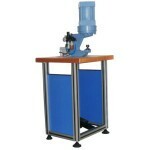 The CSTEP-2 Advanced Grommet Press is a new and advanced press for low to mid-volume work. An innovative European designed handle helps reduce the force necessary to apply grommets while the soft-grip offers increased comfort. An enlarged throat depth offers more versatility in the placement of grommets as deep as 4-1/4”. It will accept self-piercing grommets: #00 3/16”, #0 ¼”, #1 5/16”, #2 3/8”, #3 7/16” and #5.5 11/16”, with the corresponding dies. Measures 17.75” x 3.625” x 9.25” and weighs about 12 lbs. Comes standard with 1 year manufacturer’s warranty. The CSTON-1 is a “stroking” grommet press features a spring-loaded handle that requires minimum pressure on the handle to apply grommets into all thicknesses of materials. On this machine the die actually “taps” the grommet so that it rolls over the washer to fasten. The tension spring makes it tap with more or less force, depending on the material. With some thicker materials, a second pull is necessary for a snug attachment, but this is very rarely required. It has a throat capacity of 5-1/2” and measures 20.5” x 7.9” x 12.4” and weighs about 50 lbs. Comes standard with 1 year manufacturer’s warranty. 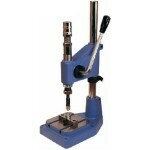 The new and improved CSPIC-2 is the ultimate pneumatic attaching machine for professional use. Its accelerated process will increase efficiency and save in labor costs. An advanced safety system will protect the operator while not interfering with the speed or work load. A pneumatic foot peddle activates the press, requiring no human-pressure other than a tap of the foot. This not only makes the job easier for the operator, but also provides consistent pressure throughout the job, so you can get a perfect outcome every time. It will work with any small air compressor (not included). The CSPIC-2 will handle all self-piercing grommet sizes. It measures 41.1” x 19.7” x 14.2” and weighs about 50 lbs. Comes standard with 1 year manufacturer’s warranty. If you are using a grommet press for thin applications, such as banners, posters and laminate, then standard self-piercing grommets are needed. These are available in a variety of sizes including. If you are using a grommet press for thicker applications, such as foam core boards, then you will need long neck self-piercing grommets where the length under the flange is bigger. 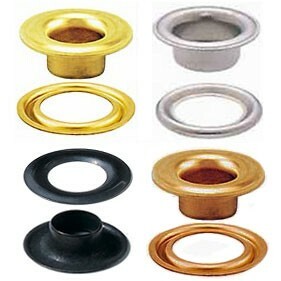 If you will be doing both thin and thick materials, it is recommended that you get both kinds of grommets. The reason for this is that if you use the long neck grommets on the thinner materials, the neck is too long to roll over onto the washer and you will be left with a grommet that spins in place. Grommet Dies are available in the same sizes as standard self-piercing grommets, including #00 3/16”, #0 ¼”, #1 5/16”, #2 3/8”, #3 7/16” and #5.5 11/16”. Special sizes, including #XX00 1/8”, #X00 11/64” and #12 1-1/2” are also available for special order. It is important that you purchase the corresponding die/grommets because they will not work with varying sizes. For example, if you have a #2 Self-Piercing die, then you can only use this with #2 and #2LN grommets. Self-Piercing Grommets are available in brass, antiqued brass, silver nickel or black. Custom colors can also be manufactured in nearly any PMS color of your choosing. Stocked in sizes #00 3/16”, #0 ¼”, #1 5/16”, #2 3/8”, #3 7/16” and #5.5 11/16”. 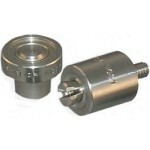 Also available in special sizes including #XX00 1/8”, #X00 11/64” and #12 1-1/2”.